While walking by the pawpaw tree I noticed the sweet smell of fruit. When I tested a few of the pawpaws 2 were soft to the touch! This means they are ready to be picked. 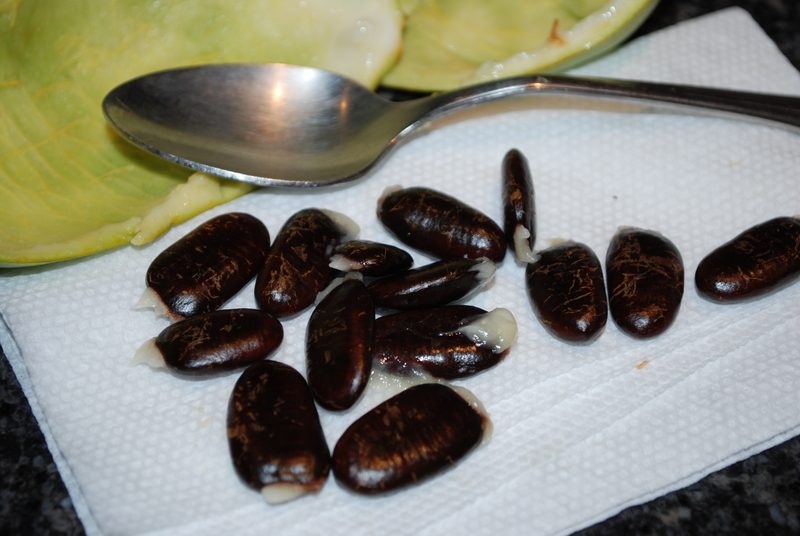 This is extra exciting because it is the first time we have pawpaws and it isn’t a fruit that is available at stores or markets. Also, my father is visiting and will be here tomorrow so he can sample them as well. This has been a long term family project to cultivate trees that produce this wonderful “exotic” fruit that is indigenous to the united states as far north as Michigan. The taste is truly its own- the texture is like a custard or creamy banana but the flavor is like a mixture of banana (not over-powering ripe banana), coconut and peaches. 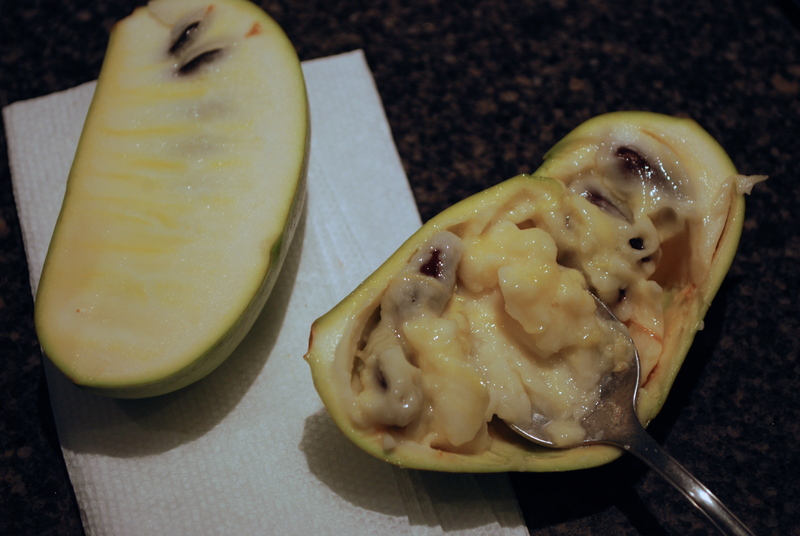 Many years ago my father got a hold of a pawpaw and I remember thinking it was like a Kahlua custard. My guess is that it was overripe after tasting this just ripe fresh from the tree. We found the best way to eat the fruit was to scoop it out with a spoon and spit the large seeds out (as delicately as possible). Xav and I are excited to share this with friends and see what they think so there may be an update with a better description of the flavor. There are so many fruits that I will also need to figure out what to do with them. 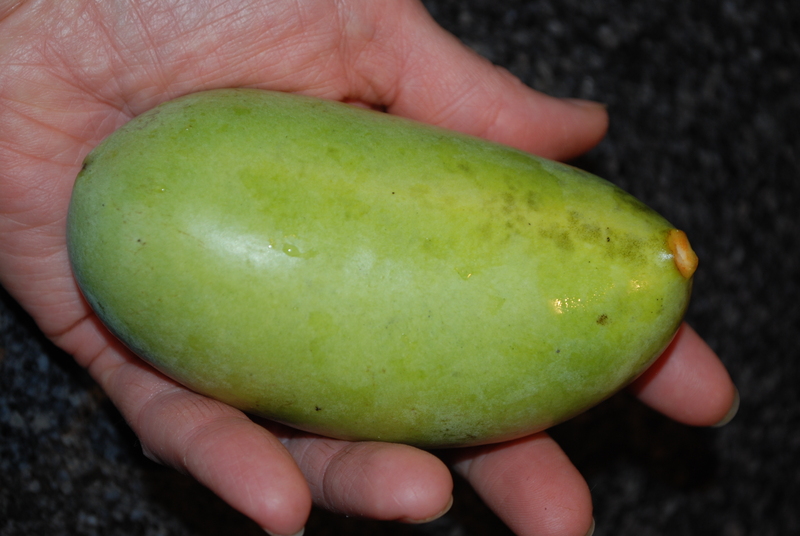 According the the Miller Nurseries catalog (where we purchased the tree) the pawpaw is “high in protein and a good source of vitamins and minerals”. Check out the detailed nutritional breakdown I found through Kentucky State University. I am saving the seeds because my father is interested in starting a tree from seed and this particular tree is quite beautiful and produced an abundance of fruit. This entry was posted in in the garden and tagged fruit, nutritional, nutritious, pawpaw, value on September 29, 2013 by lenapietri. Cook quinoa- bring 1/2 cup quinoa and 1 cup water to a boil, reduce heat and simmer till water is absorbed (about 20 minutes), place into a glass or ceramic bowl/casserole dish and add the garlic, lemon juice, olive oil, salt and pepper, stir, cover and set aside to marinate at least 1 hour. Add the remaining ingredients stir and serve. Combine all ingredients and set aside for at least 1 hour. The arugula is fresh from our garden and nearly the last of the season. I ate mine with a few chunks of goat milk brie (if I had feta at home that would have been ideal) but omit for a vegan meal. Xav enjoyed his with a sprouted whole grain tortillas but any bread or flat bread will do. 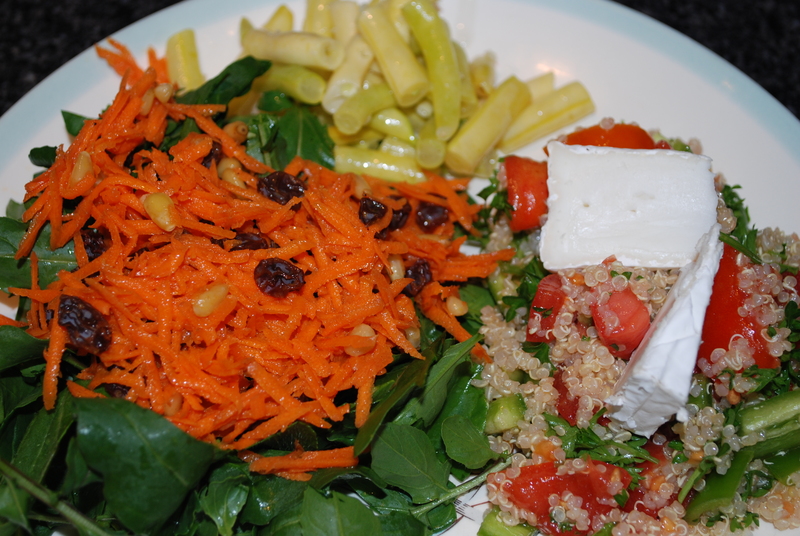 This entry was posted in in the garden, in the kitchen and tagged carrots, dinner, gluten free, marinated, quinoa, salad, tabouli, vegan, vegetarian, yellow wax beans on September 29, 2013 by lenapietri. Preheat oven to 350° F. Grease a 9” square glass pan (I use a pastry brush to apply the coconut oil). Blend together coconut oil, brown sugar and vanilla. Add eggs, 1 at a time, beating well after each. Mix together oat flour, cocoa, baking powder and salt then stir gently into oil and sugar mixture. Mix in raisins, nuts and/or chocolate chips if using. Bake 20-25 minutes. 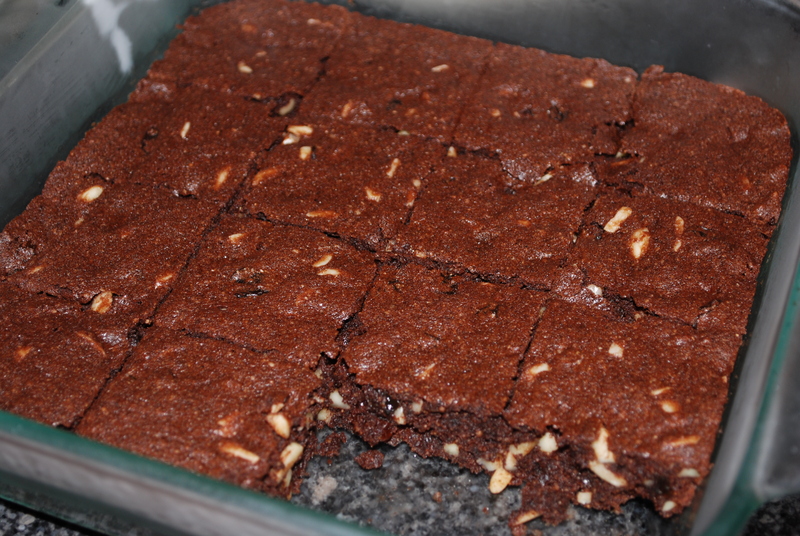 Allow to cool, chill in refrigerator before cutting into squares and removing from pan carefully with a spatula. 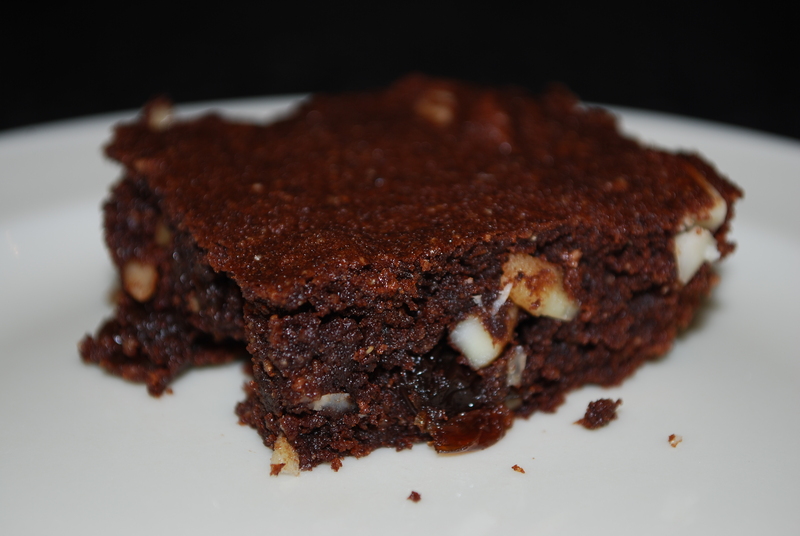 This entry was posted in in the kitchen and tagged brownies, dairy, dairy free, free, gluten, gluten free, homemade, lactose, lactose free, nuts, raisins, recipe on September 21, 2013 by lenapietri. 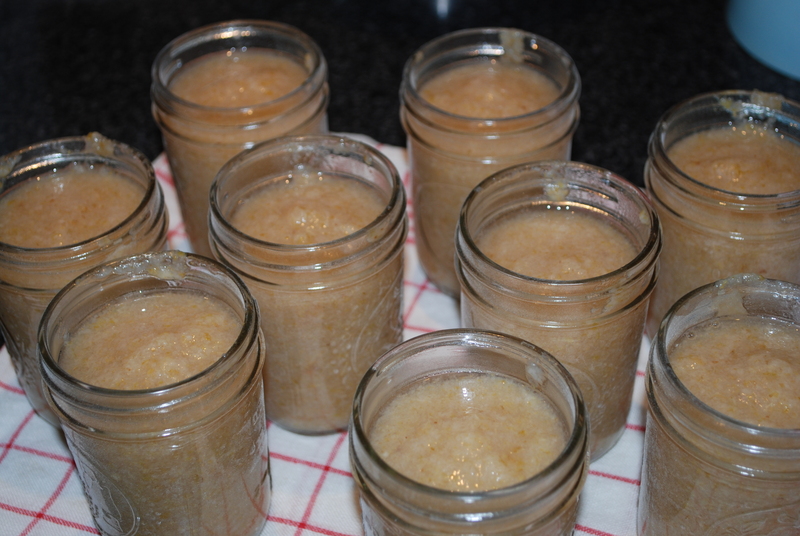 I basically followed the recipe for applesauce from the Ball website substituting pears for the apples, cutting the recipe in half and omitting the sugar. I also decided to go with half pint jars. 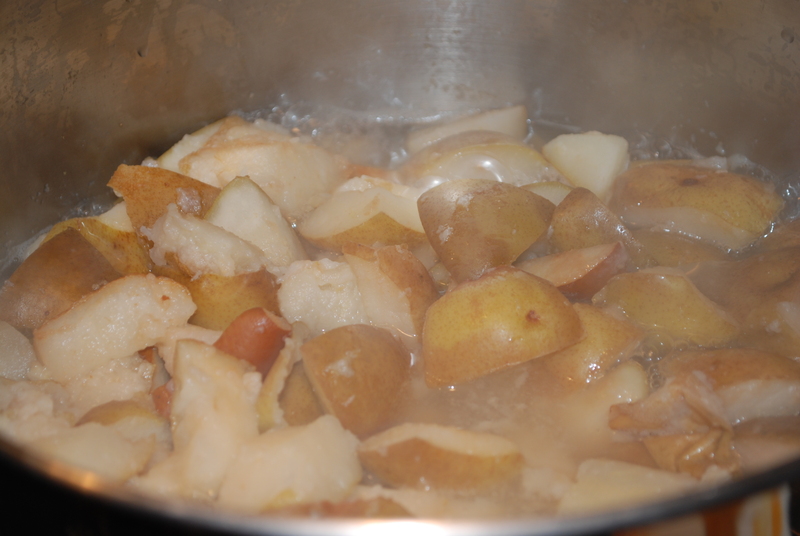 Pour enough water to cover the bottom of a large stainless steal stock pot, add the pears and bring to a boil over medium high heat. 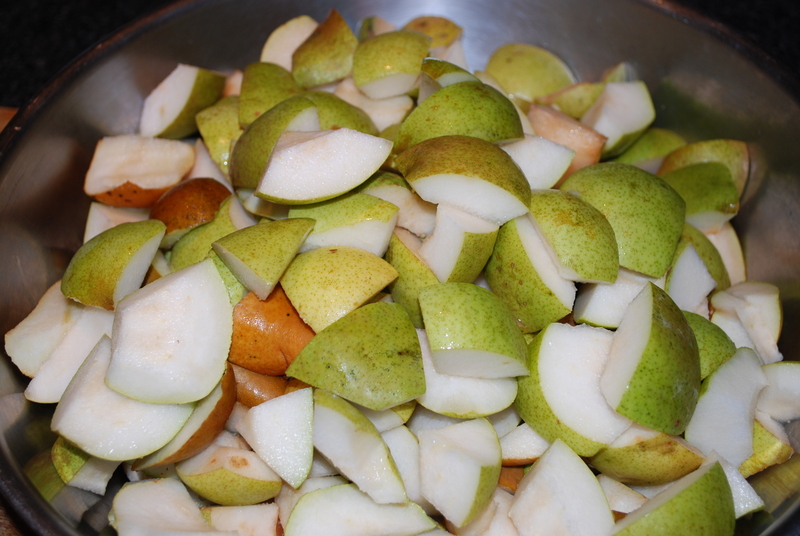 Reduce heat and simmer, stirring occasionally, until the pears are tender (5-20 minutes) depending on the type and ripeness. 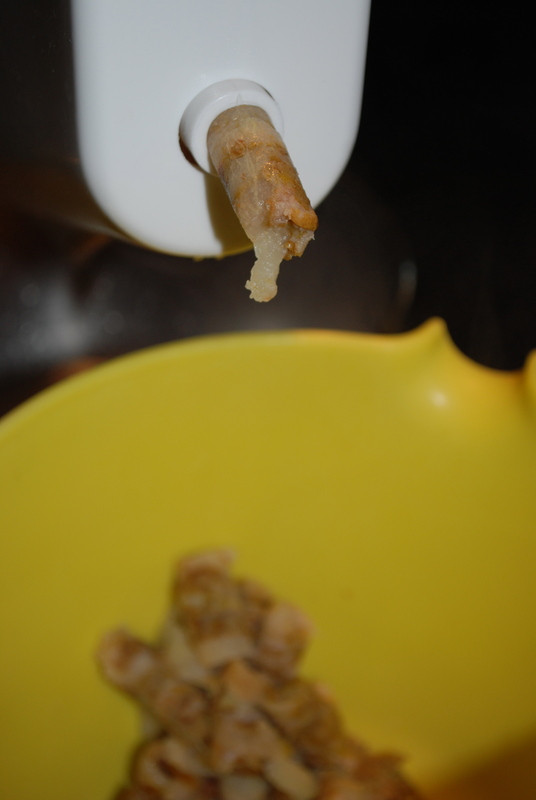 Remove from heat and allow to cool for 15 minutes. 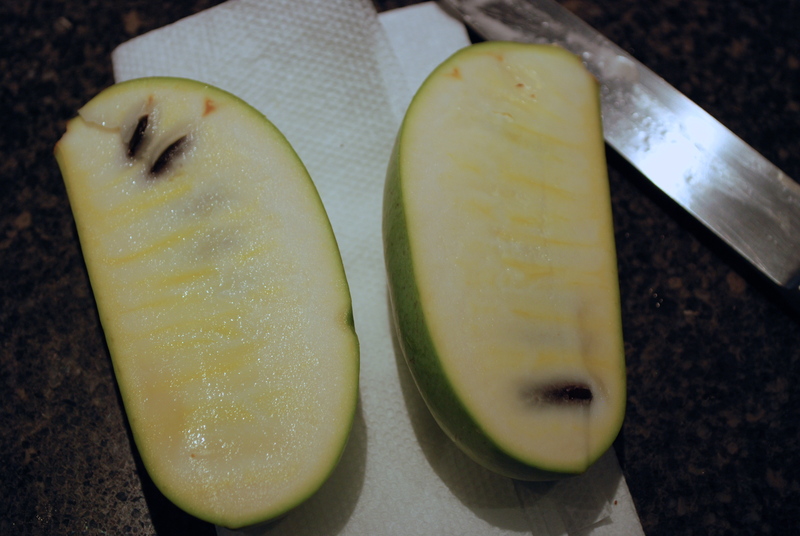 Put the cooked pears through a vegetable strainer. 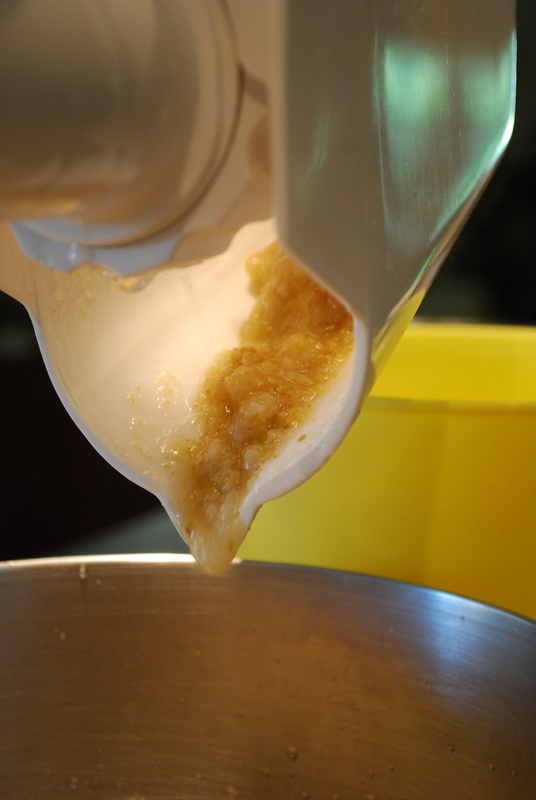 The peal will be extracted from the end and the lovely pear puree will glide effortlessly into a bowl. 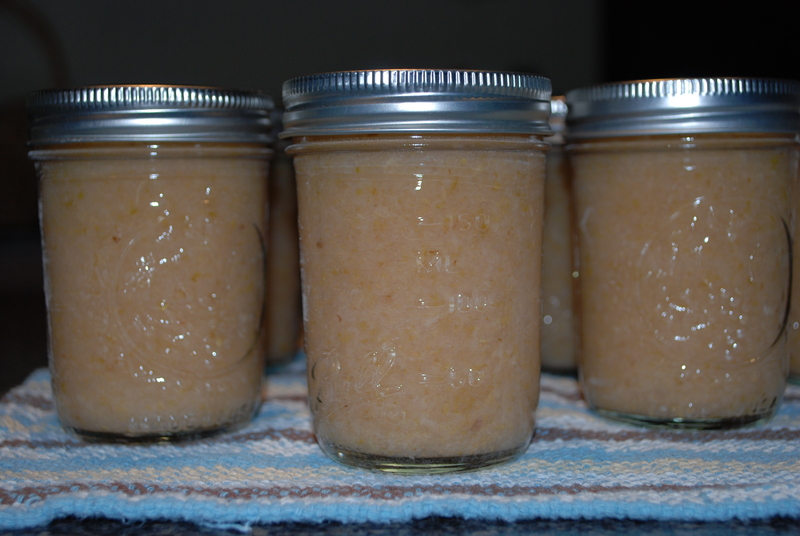 **if you do not own a vegetable strainer you can still make pear sauce as long as you peel the pears and remove all stems and hard spots. 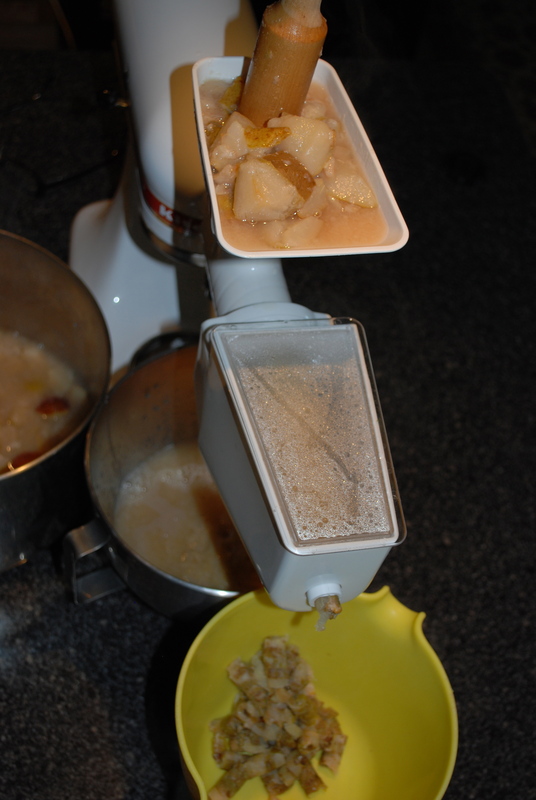 The cooked pears can be pureed in batches in a food processor or blender. Return the pear purée to the stock pot and add lemon juice. 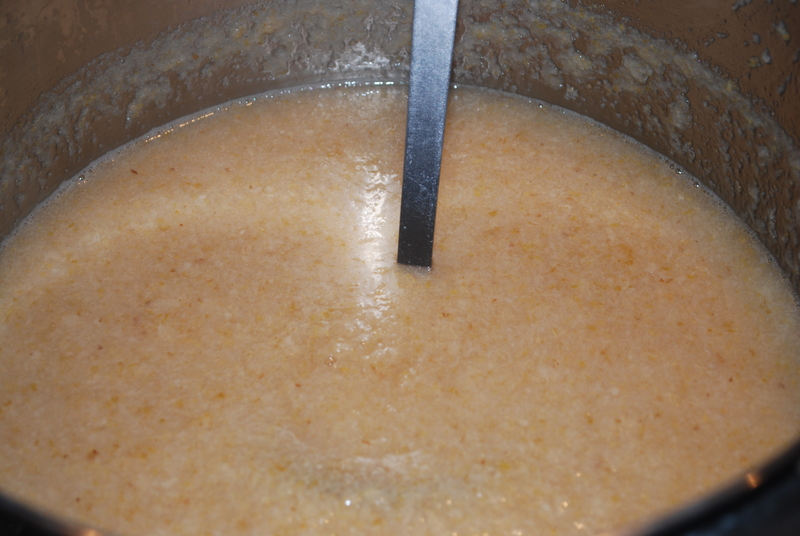 Bring to a boil over medium-high heat, stirring frequently to prevent sticking or burning. Fill the hot jars immediately with the hot pearsauce. Ladle the hot pearsauce into hot jars leaving 1/2 inch headspace. If your sauce is very thick remove air bubbles (tap jars on a thick towel so the sauce goes down and the air up or use a spatula and run it up and down along the interior edges of the jar). If your sauce is thin enough to pour in and settle without air into the jars like mine was skip that step. Wipe rims with a clean damp paper towel, center lids on jars and secure the bands. Process the jars by placing the filled jars back into the canning pot and bring to a boil with water (I usually leave the hot water from the sterilizing step in the pot so it is still hot and heats up to a boil quicker). Boil for 20 minutes, remove jars and cool. The “popping” sound of the lids sealing is so exciting! Check lids for a proper seal after 24 hours- the lid should not flex up and down when the center is pressed. This entry was posted in in the garden, in the kitchen and tagged anjou, canning, homemade, pears, pearsauce, preserving, sauce, water bath on September 21, 2013 by lenapietri. Yesterday while dining outside on the patio I noticed dirt flying up into the air in the back corner of the property. I wondered what could be digging so furiously. 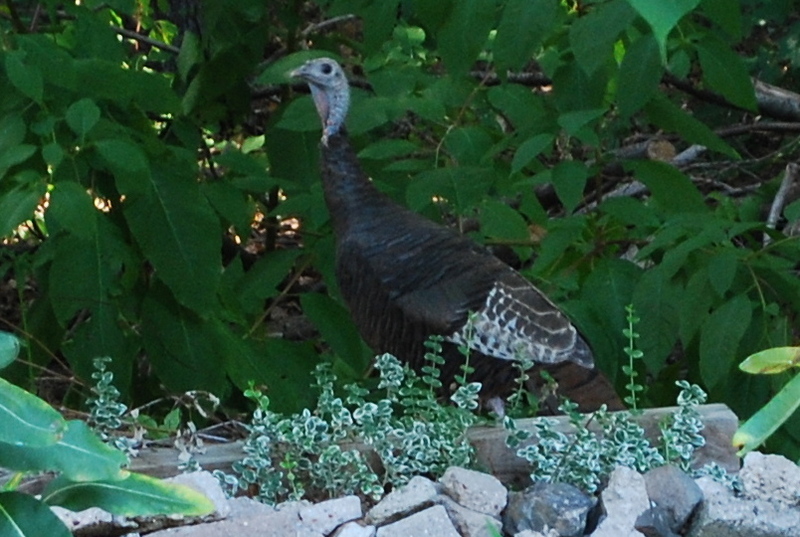 Upon inspection I noticed a wild turkey hen was taking a dirt bath. Dashing inside for my camera I was hoping that I could get close enough to capture her. Earlier in the spring she walked through with her chicks but was much to cautious to let me anywhere near them. She came alone so the little ones must already be on their own. Here she is walking past “DadCat”. This old guy adopted our garden as his hunting territory years ago. As male cats do he also was a heavy sprayer in strategic places. Xav used to chase him off the property but he would return daily. Over the years his eyesight and hearing have deteriorated (obviously since he is totally oblivious to the large turkey hen waking by) and he walks with what I call a limp but others a swagger. The kids and I refer to him as “DadCat” because after Xav’s knee surgery he and the cat had the same limp/swagger. Xav’s hearing is going after years in the construction industry and he has been caught squinting 6 inches from the computer screen. I’m not sure if the chasing has ceased because DadCat stopped spraying or neither of them can run. 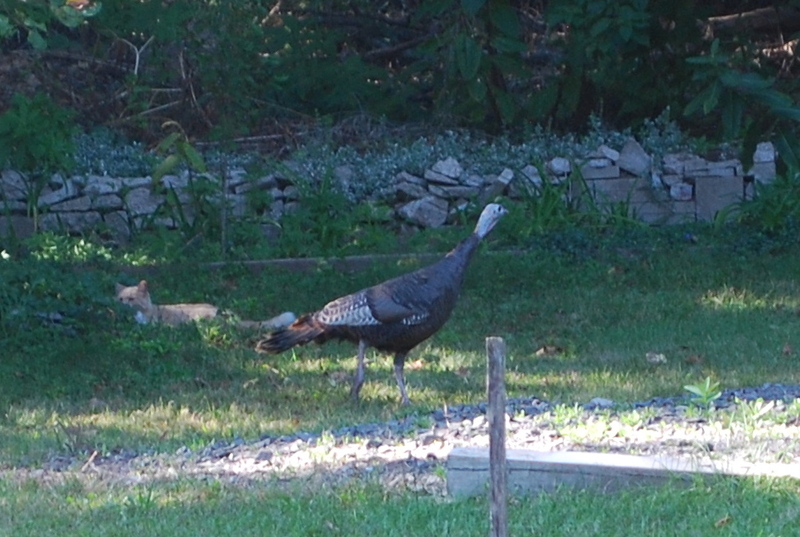 This entry was posted in in the garden and tagged ct, hen, plainville, turkey, wild on September 21, 2013 by lenapietri. I purchased a spaghetti squash at last week’s farmers market. Coincidentally, my daughter called from college about the week’s produce from the CSA share she purchased with her housemates. How wonderful that a farm near her college offers a discounted CSA for students that only get to enjoy part of the season! 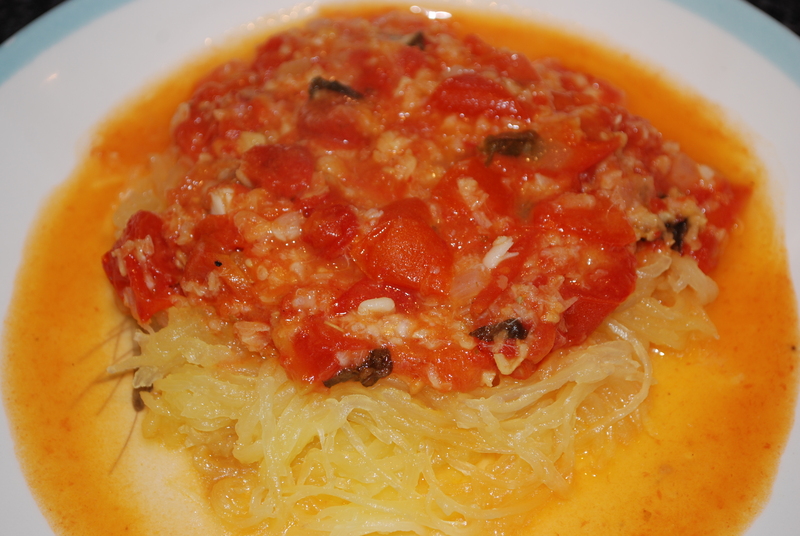 She asked how I make “the spaghetti squash with the marinara with lentils to make it healthier” inspiring me to make that dish for my husband and myself. Start by soaking 1 cup of moong dal in 4 cups of water during the work/school day. Any lentil will do but pictured here is the dish made with moong dal (I purchased the Deep brand from a local Asian market). Moon dal is high in protein making it great for vegans/vegetarians; 24 g per serving. Meanwhile, wash the spaghetti squash, cut in half lengthwise, scoop out the seeds with a spoon and place cut side down on an oiled baking sheet. Drain and rinse the moong dal/lentils and allow to drain in a sieve. Place soaked and rinsed moong dal (or lentil) into a medium sized pot and add 4 cups water and bring to a boil. Reduce heat and simmer until tender, 20-30 minutes depending on the dal/lentil. Place the prepared squash into the preheated oven and bake until tender when pushed with the back of a wooden spoon, about 30 minutes. Preheat a wide bottomed stock pot over medium heat and chop the onions. Add olive oil and onions and saute under cover until tender, about 5 minutes. Meanwhile chop the tomatoes then add to the sauted onions, put the cover on, bring to a boil, boil for 5 minutes until the tomatoes begin to break up then remove the cover and allow to reduce (cooking so the steam reduces the amount of water from the fresh tomatoes) for about 30 minutes (if using boxed/canned tomatoes skip the reduction step). Drain the cooked moong dal (or lentil) well in a sieve and set aside. Add the salt, pepper, basil, oregano and garlic to the tomatoes and stir. Continue to simmer for another 10 minutes. 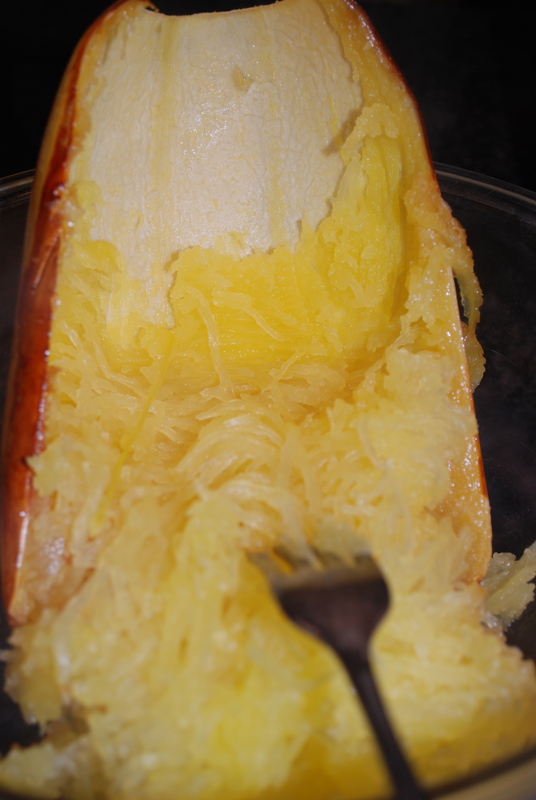 When the spaghetti squash has cooled enough to handle (I usually use an oven mitt that is easy to launder) hold it in a bowl and using a fork scrape out the baked squash flesh- it will come out in “spaghetti” strips. Set the bowl of spaghetti squash aside. Add the drained moong dal (or lentil) to the marinara sauce, stir and bring to a simmer again then remove from the heat and serve over the spaghetti squash. This entry was posted in in the kitchen and tagged dal, fresh tomatoes, gluten free, homemade, marinara sauce, moong, spaghett, squash, vegan, vegetarian on September 19, 2013 by lenapietri. 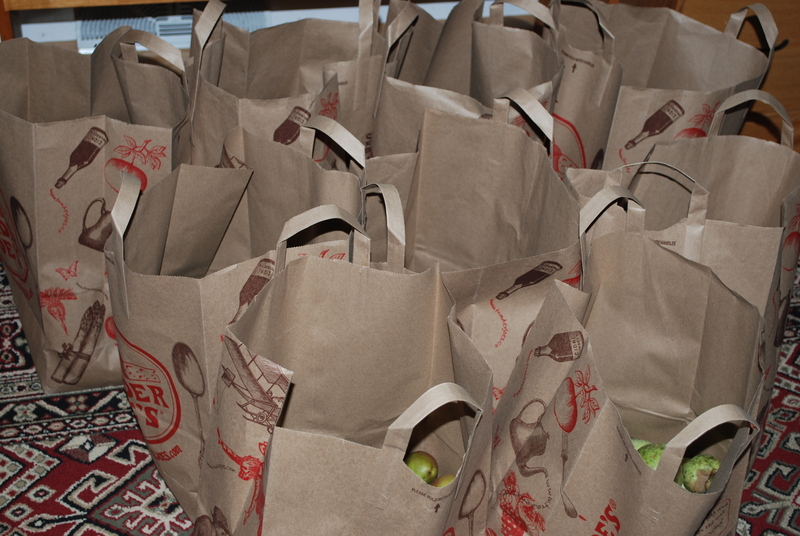 So Many Pears—So Little Time! We harvested bosc, seckel and anjou pears today and there just isn’t enough time to go through all of them and figure out what to do with them all. We do not have a second refrigerator. Pear sauce, pear pie filling, pears for eating (but honestly, who could ever eat all of those?) and pear pickles? Maybe it will all seem less overwhelming when I come home from work tomorrow. 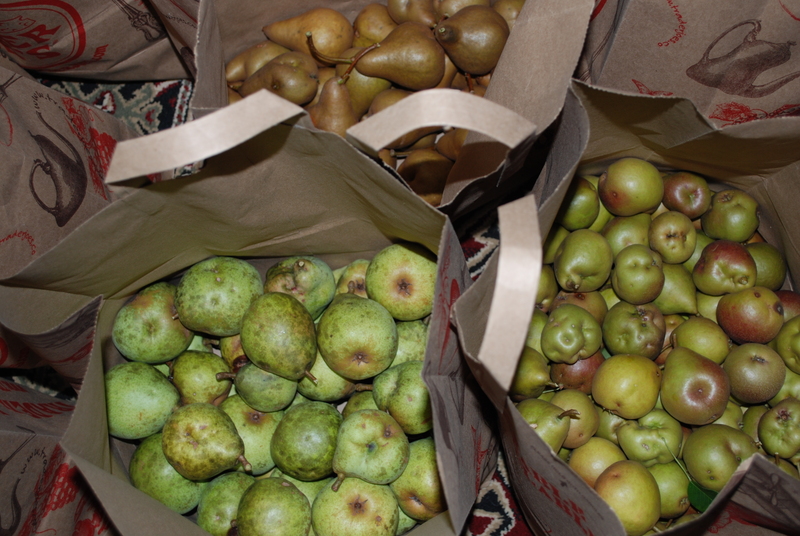 The bosc pears are all washed and sorted so that only leaves 7 out of 9 bags to go. This entry was posted in in the garden and tagged anjou, bosc, ct, pears, plainville, seckel on September 9, 2013 by lenapietri.